The curiosities, cleverness, and cuteness of birds are showcased here in exceptional images handpicked from the portfolios of professional wildlife photographers. 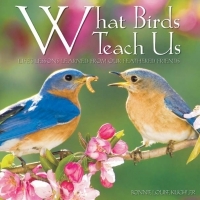 From breaking out of a shell to leaving the nest, from mate-finding to mirgrating, from surviving to thriving, our feathered friends share birdseeds of wisdom, dipped in the nectar of fun. With forty-eight images alongside insightful and humorous tips, What Birds Teach Us is a visual and inspiring treat for anyone who enjoys birds. Nature has many lessons to offer, and some of her teachers wear feathers.